If you haven’t heard the news already, all you have to do is go online and type Yeti-NRA. The news is all over that Yeti is the latest company to cut ties with the National Rifle Association (NRA). What happened, exactly? The National Rifle Association has found itself to be the scapegoat for most of the vitriol coming from anti-gun activists and now corporations are joining the fray. In the wake of a recent shooting at a Florida high school where 17 were killed, a number of companies have severed ties with the pro-second amendment movement. They include REI, Enterprise Rent-A-Car, Delta and United Airlines, and now Yeti Coolers. In an email to its users, the NRA’s Institute for Legislative action announced that Yeti had refused to do business with the movement but wouldn’t explain why. Here is what the email said, in part. Suddenly, without prior notice, YETI has declined to do business with The NRA Foundation saying they no longer wish to be an NRA vendor, and refused to say why. They will only say they will no longer sell products to The NRA Foundation. That certainly isn’t sportsmanlike. The move by Yeti led to significant backlash online with many customers who supported the NRA taking to Twitter and Facebook to express their anger over the decision. Many believe that the move is one that Yeti will come to regret as a significant portion of their customer base consists of NRA supporters. IT is truly bizarre because a significant portion of Yeti’s customers are pro-second amendment. Yeti is now the subject of multiple roasts across social media with hashtags like #BoycottYeti gaining traction. One thing that should be noted is that this story is mainly given from the NRA’s perspective as the stories are based on an email they sent their supporters. Yeti hasn’t made an official statement on the matter yet. YETI now issued their statement, calling NRA’s statement inaccurate. If it’s indeed a mistake then, unfortunately, it might turn into a very costly one. We will continue to monitor the YETI – NRA developments and we’ll be updating this post. What is Our Stance on the Matter? As you, our reader, know, we are a non-partisan publication. We don’t like to get embroiled in the politics of the matter and prefer to give objective accounts and reviews of the products that are featured on our site. As a result, we really want to stay objective on this one and would rather not give our opinion about whether Yeti made a good decision or a bad one. The truth of the matter is, gun laws are a very hot topic across the country right now and, regardless of which side eventually wins the debate, corporations will find themselves dragged into the battle, especially if it means making a quick buck. For many of the companies ceasing their business with the NRA, it’s a question of making a choice between appeasing their liberal customers by virtue-signaling or accommodating the section of their customers that support the Second Amendment and movements like the NRA. It’s a gamble that may or may not pay off. What we see is Yeti taking a gamble. Whether it works or not, in the long run, is something that will take the long run to determine. 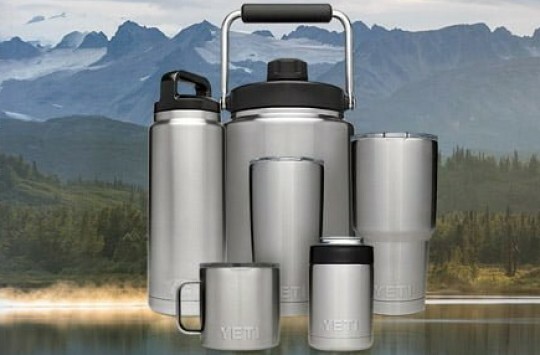 Yeti coolers may be expensive, with some of them costing just shy of $1300, but they are very high-quality coolers. They are of such undisputable qualities that they have a reputation as the industry standard. That said, Yeti isn’t the only cooler company out there providing great quality coolers. In fact, many models produced by some reputable companies, like RTIC and Orca, are comparable in quality to Yeti and are also much cheaper. Moreover, these companies are still very much pro-NRA, so you won’t have to compromise on your loyalties. Despite our need to stay objective, we feel obliged to provide our readers with an alternative to Yeti coolers, so they know they have options. Some time ago we published an extensive guide for those looking for best coolers like Yeti, but now we wanted to update that list and share the current top picks for coolers that could replace Yeti for an NRA supporter. RTIC coolers are well known for being high-quality coolers with a bunch of features users will enjoy, but how do they stack up against Yeti? For starters, the best comparison we have previously made on our site was the RTIC 45 vs. the Yeti Tundra 45. They are both roto molded and have the same capacity, with the RTIC cooler having slightly larger dimensions. 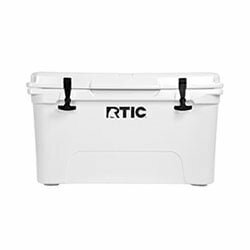 Actually, in terms of real capacity, the RTIC can hold up to 36 cans with 40 pounds of ice while the Yeti Tundra 45 will only hold 26 cans with 35 pounds of ice. Here you can see a clear advantage. When it comes to ice retention, Yeti doesn’t make any mention of how long their coolers will keep ice. However, independent 3rd party reports, including our own, have pegged it to approximately 11 days. Meanwhile, RTIC claim on their websites that their coolers will retain ice for up to 10 days, with some independent users claiming they managed 14 straight days. It must be remembered, though, that ice retention is dependent on a lot of factors and can vary depending on the environmental conditions. 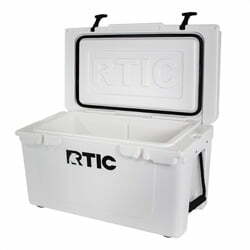 All the same, both the RTIC and Yeti are very good at retaining ice, so one can easily stand in for the other. Check RTIC coolers on Amazon or read full review here. Orca is a premium brand, just like Yeti. Each company has a long and rich history in the industry, and they are currently pretty much head to head competitors who both investing heavily in research to improve the design of their products. Orca has two major advantages over Yeti, right off the bat. The first has always been there; the second is a recent development. First, Orca coolers are 100% American made. Yeti outsource some of their manufacturing to China and Philippines. Second, Orca supports the NRA and are one of their vendors. 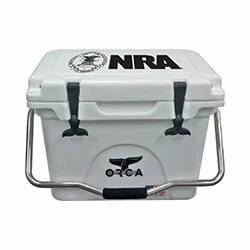 What’s more, Orca now offers a special Orca NRA line of its coolers that included sizes ranging from 20qt up to 75qt and color selection of white, tan, green, pink and more. However, bear in mind that due to a recent spike in demand, availability of these coolers might be limited – click here to check if they’re in stock on Amazon). Orca is also known for very good ice retention times, with the manufacturers themselves claiming their coolers can easily last up to 10 days. This is comparable to, if not better than Yeti’s reported performance. When it comes to security as well, Orca does just as well as, if not better than Yeti. Each Orca cooler has drilled out corners that line the lid up with the rest of the cooler, making it easy to place two locks on either side. Yeti is also known for having this capability. Feature for feature, we’d say Orca coolers are a pretty good alternative to Yeti. Check Orca coolers on Amazon or read our full review and comparison to Yeti here. Pelican coolers are a very popular name in the cooler industry, having been around for a long time. They produce very good quality coolers with lots of features you will find useful as a user (full story here). 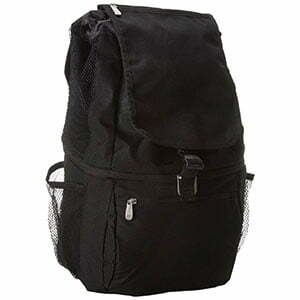 For starters, they provide a variety of coolers at different capacities. Anything from 20-quart cooler to a 250-quart cooler is available for your choosing. They also have good ice retention times, which we tested ourselves. The best cooler retained ice for up to 8 days. We find that pretty remarkable. On top of this, they are very durable and come with a limited lifetime warranty. It doesn’t get much better than that. 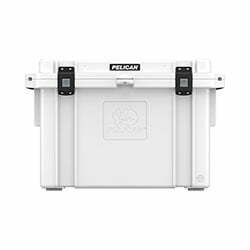 Check Pelican coolers on Amazon or read our “Pelican vs Yeti” post here. Frio is a great cooler out of Texas, made by Texans for all the rest of us. Apart from being supporters of the NRA, they are notable for their unique design. This is like a breath of fresh air in an industry where everyone is trying to rip Yeti off. 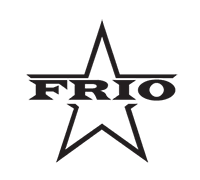 Frio also has great build quality with their coolers having been tested vigorously by the Frio people themselves. These beasts seem capable of surviving just about anything. They are customizable, are made in the USA, are cheaper than Yeti, and have respectable ice retention rates. They are a small brand but, given enough traction, will give Yeti a run for their money. Check Frio coolers on Amazon or read full review here. 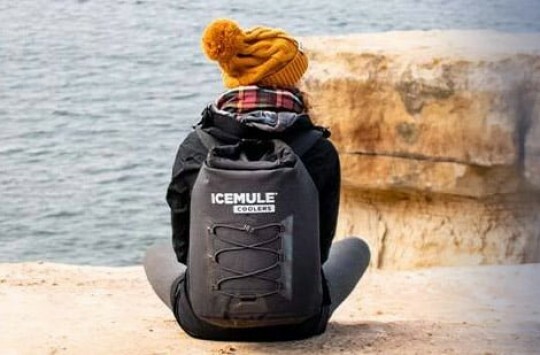 The idea here is that feature for feature, this cooler brand is probably the next generation Yeti, and their products are already giving Yeti a serious run for their money. Kong has some great unique features that make it stand out against Yeti. 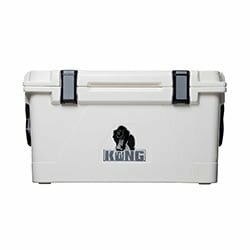 Kong coolers have padded handles, which feel much more solid than the Yeti Tundra’s rope handles. They also have side handles which make for easier transportation, as opposed to Yeti’s single loop handle. Kong’s greatest innovation, perhaps, are their pressure latches. These latches will hold against anything and have a better design than Yeti’s T-Rex handles. Kong coolers also have a remarkable ice retention of up to 11 days. Get Kong coolers on Amazon or read our full Kong cooler review. 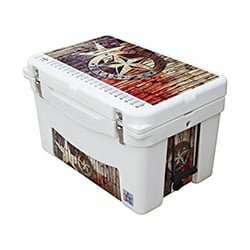 Milee coolers are a pretty easygoing cooler with all the basic features you might want in a cooler. 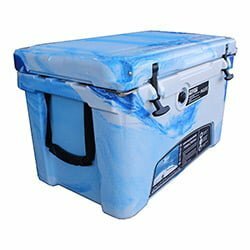 They have an uncanny resemblance to Yeti and Vibe coolers, but they are also unique in their own way. They come with accessories like a chopping board, cup holder, and basket included and have extra features like a pressure release button included. 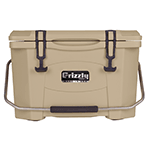 The major advantage this cooler has over Yeti is its affordability. However, we can’t really say it beats Yeti in terms of features and ice retention. 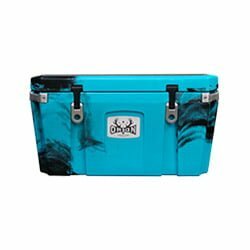 All the same, it’s a pretty good cooler for the price and will give you more capacity than a Yeti of a comparable price. Get Milee coolers on Amazon or read our Milee cooler review here. 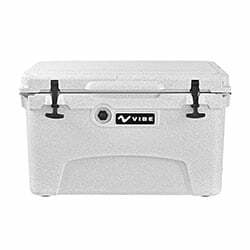 Vibe coolers are a relatively new player on the market, compared to Yeti. They only came onto the scene in 2013, after all. 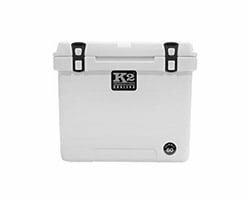 However, being made by Kayaking enthusiasts, these coolers are excellent and have found themselves a niche among the kayaking community. They have certain features that you won’t find on a Yeti, including a fish ruler and double bottle opener. Yeti may rule supreme in things like capacity and ice retention, but Vibe are good enough to pass for the average adventurer. Check Vibe coolers on Amazon or read our review here. The recent developments concerning Yeti and the NRA, while truly sensational, do not mean there is now going to be a dearth of options for those looking for alternatives to Yeti. To be sure, the market has plenty of great brands, some of which can even provide better quality than Yeti at a lower price. We’re pretty sure you’ll find something in the list above that will work for you. 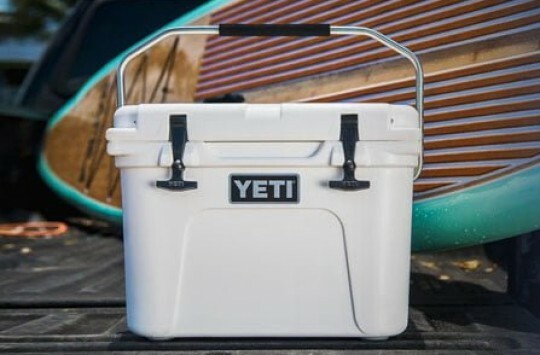 We mentioned some of the best alternatives to Yeti but there are even more of them so be sure to read our post about coolers like Yetis but cheaper to learn more. 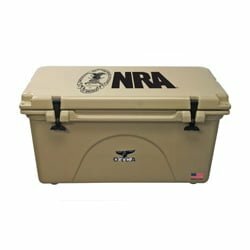 Do you know of any other pro-NRA cooler alternatives? Be sure to tell us all about them in the comments! Great non partisan article. Thank you. Kudos for an attempt at non bias. I mean that sincerely. I also must say I think you fell short of that goal. Simply put, wouldnt a list of Yeti alternatives have been useful without ANY commentary? Regardless, thanks for the list. I’m buying Yeti!!! Good for them for supporting an America that realizes enacting safer gun laws does NOT mean taking everyones guns away from them. Innocent children and victims ARE more important than NRA getting richer by fear-mongering. How is restricting the rights of law abiding gun owners going to protect innocent children and victims? It’s the complete opposite. Criminals aren’t going to lay down their illegal guns or stop committing crimes. Now you’re just going to have an entire populace that is unable to legally protect themselves or their families from these crazy criminals. I really don’t understand your logic at all. Please feel free to email me and explain. Thanks for help with picking out a cooler … will definitely go with Yeti.